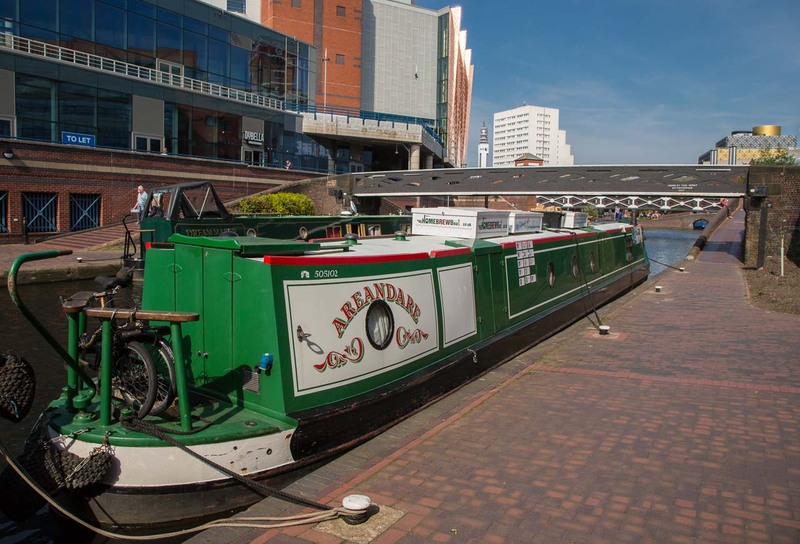 Today, wandering around the Brindleyplace area of the BCN canal in Central Birmingham, I came across Barry Teutenberg and his narrow boat AreandAre. 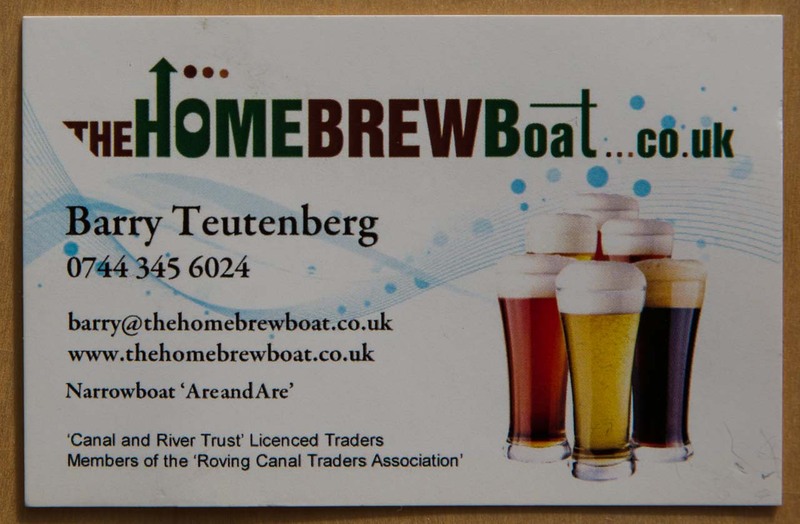 He is a roving canal boat trader and sells kits for brewing your own wine beer and spirits. No this is not an advertisement 😉 it’s just a story resulting from our first and ad hoc meeting. Hailing from New Zealand, he decided to settle in the UK with his wife Sandra who comes from Sutton Coldfield. For a number of years, he conducted his profession as a photographer. But, he says, the photography trade became overcrowded and expensive to maintain the essential tools of the trade. 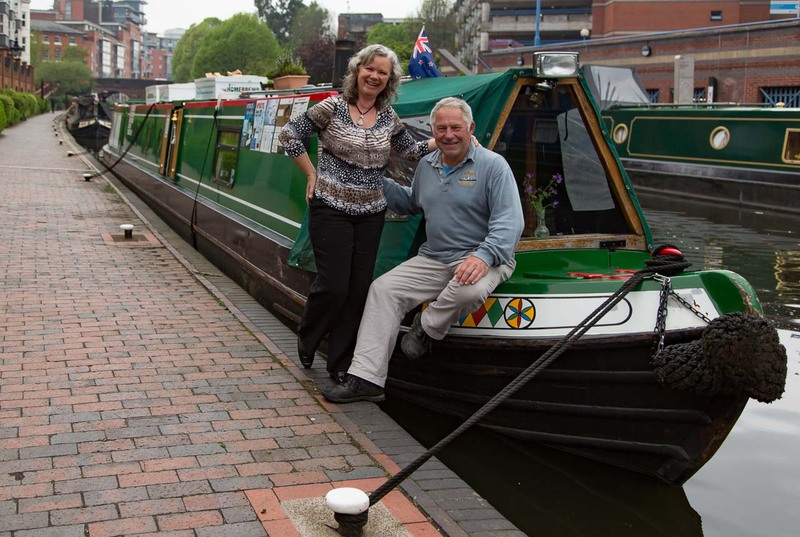 So, eventually he decided to become a boat trader and set up his boat and online business in February 2014. They travel with their boat around the canal network for as much as 10 months each year outside which they live moored in a marina. The website is a wonderland for home brewers and well worth a visit for ex home brewers – it has a splendidly vibrant presentation! It contains a map with places and dates where they will be moored and when. He also runs a blog nbareandare.com . 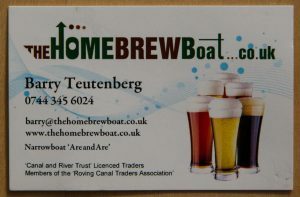 From his business card, shown above, you can see that he is a Canal and River Trust Licensed Trader and a member of the Roving Canal Traders Association. Looking from the rear of the boat moored by Brindleyplace, in Birmingham city centre, on the left is the Barclaycard Arena and ahead in the distance the iconic Library of Birmingham – well worth a visit Monday to Saturday.